That’s particularly key because studies suggest that as many as 71 percent of under-50s diagnosed with colorectal cancer are already in the third or fourth stage of the disease, when it has spread into nearby tissues or metastasized to further organs. But once it metastasizes, the five-year survival rate plummets to 14 percent. Targeted therapies and immunotherapies are available to treat colorectal cancer, but only some forms. For the rest, the standard treatment is chemotherapy. 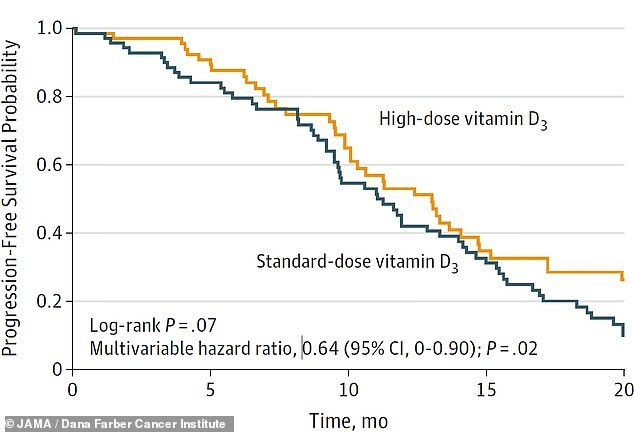 ‘The results of our trial suggest an improved outcome for patients who received vitamin D supplementation, and we look forward to launching a larger trial to confirm these exciting and provocative findings,’ said senior study author Dr Charles Fuchs, a former Dana-Farber oncologist who is now at Yale University. Perhaps best of all, vitamin D is a cheap complementary treatment. A bottle of 300 1,000 IU capsules costs about $15. ‘This could therefore potentially have a large and wide-reaching impact globally, regardless of a patient’s socioeconomic status or a country’s resources,’ said Dr Ng.